Creamy chickpeas with lemon juice and tahini, served with pita bread. Avocado, spring onion, cream cheese, lemon juice, spices and olive oil served with pita bread. Selection of hummus, mamakado, tarama, baba gahnuj and yoghurt, served with pita bread, olive oil and special sauces. 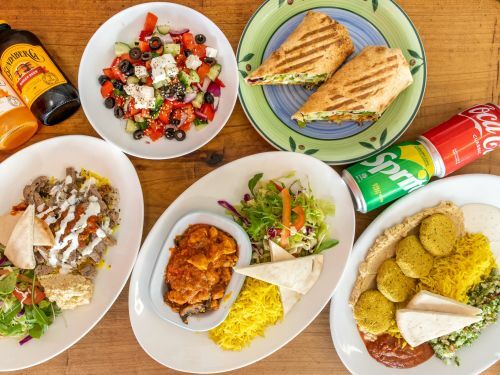 From the famous spit, either chicken, lamb or falafel patties served in a Lebanese pita roll with hummus, lettuce, tomato, capsicum,cucumber, chilli sauce and yoghurt dip. Pan-fried chicken or lamb from the spit served layered on a bed of hummus with tabouleh, minted yoghurt and mild chilli sauce. Lamb or chicken carved from the spit and served on a bed of ricewith chilli sauce, yoghurt, salad, tabouleh and a sliced pita. Sliced lamb or chicken from the spit on diced pita bread, topped with yoghurt, mild chilli sauce and chopped cashew nuts piece. Authentic Turkish dish of diced lamb slow-cooked in the oven with special home made gravy, and served with rice salad and pita bread. Layers of eggplant, potatoes, capsicum, lamb topped with bechamel sauce and mozzarella, and served hot with rice, tabouleh and yoghurt. Famous Turkish dish of diced chicken, capsicum, mushroom, garlic, tomatoes and traditional spices, served with rice, salad, pita and sauces. Marinated chicken cubes on a traditional kebab skewer, chargrilled and served on a bed of rice with salad and pita bread. Two pieces lamb shanks marinated using our own secret recipe, slow cooked, served with rice, sauces, pita and salad. A combination of sliced lamb and chicken from the spit served on abed of rice and salad. Our home-made falafel patties, deep fried in soya oil and served in a Lebanese pita roll with hummus, tabouleh and special sauces. Layers of filo pastry, with spinach, onion, herbs, feta, ricotta cream cheese, tahini, oven-baked and served with hummus, yoghurt, tabouleh and mild chilli sauce. Our famous home made falafel patties, deep fried in soya oil, and served with rice, hummus, tabouleh and our own special sauces. Green beans, eggplant, potato, mushroom, sliced red capsicum, topped with bechamel sauce, mozzarella and served with rice, yoghurt and chilli sauce. Combination of ottomans and Turkish boreks, dolmades and served with hummus, tabouleh, yoghurt, and mild chilli sauce. Fresh tomato, cucumber, red onion, capsicum, feta, olives and Greek dressing. Chicken from spit with, Choban & green salad feta cheese, sliced mango, cashew nuts, sauces balsamic dressing, slice of pita. Lamb from spit with, Choban & green salad feta cheese, sliced mango, cashew nuts, sauces balsamic dressing, slice of pita. Chicken breast marinated in our home made marinade, grilled and served on a bed of salad with pita bread, feta, hummus and sauces. Two pieces of baklava made from filo pastry layered with chopped cashew nuts, drizzled with light honey syrup and oven baked.